United Kingdom is a dream country for the people of many developing and underdeveloped nations of the world because of the facilities and opportunities it provides to the residing people. UK is the fifth largest economy of the world in terms of nominal GDP. The economy of UK comprises the economies of England, Scotland, Wales and Northern Ireland. 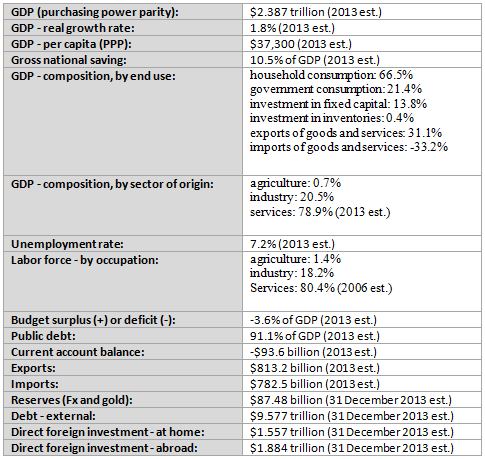 The economic data presented in the table below is collected from The World Factbook of CIA. As other developed countries economy of UK is dominated by the service industry, which comprises 78.9% of total GDP and employs 80.4% of total labour force (2013). UK has a large industrial sector also, which comprises 20.5% of total GDP and employs 18.2% of total labour force (2013). The energy sector of United Kingdom is not large enough to affect the price of any energy commodity in the international market, but for the economy of UK energy sector plays significant role. Following table illustrates (The World Factbook, CIA) the energy sector data of the United Kingdom. The numbers in left column of the table represent the world wide rankings. In 2013 United Kingdom was the fifth largest exporter and fifth largest importer of the world, and it had second largest stock of inward foreign direct investment and second largest stock of outward foreign direct investment. United Kingdom's largest international trade partner is Germany. Following table contains the top export partners of UK and top import partners of UK. United Kingdom mainly exports the manufactured products, and also import the manufactured products. Following table illustrates the top five products imported by UK and top five products exported by UK. What are the strengths, weaknesses, opportunities and threats of United Kingdom's economy? Which domestic sectors largely affect the United Kingdom's economy? Can United Kingdom affect the price of any commodity in the international market? Is United Kingdom's economy affected by the price of any commodity in the international market? Dear Traders, we know economies are not static rather dynamic, so the economic dimensions of a nation change every day, and forex traders need to study the latest economic situation. I will edit this post whenever a new addition of The World Factbook of CIA comes out. You can visit Wikipedia and The World Factbook of CIA to know more about the economy of United Kingdom.